It was decorated to look kind of like an eye exam chart with the font on each line getting progressively smaller. 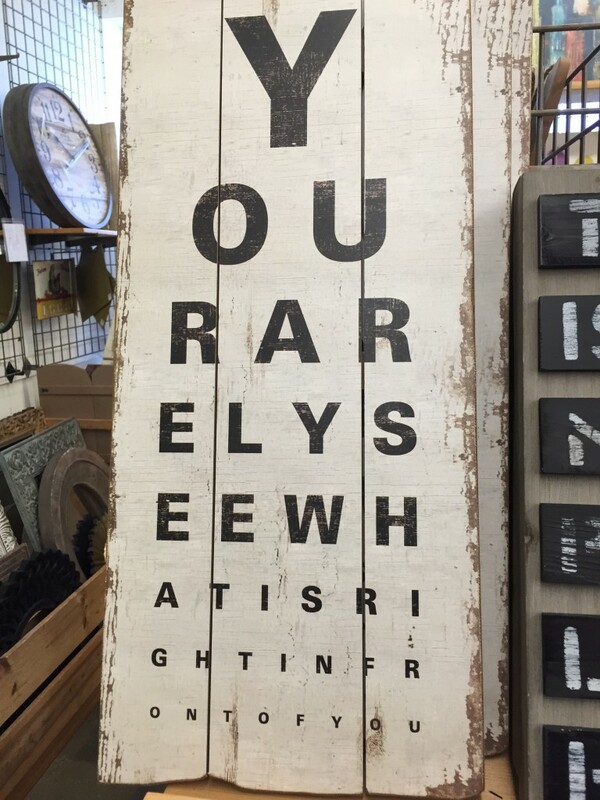 I think it took me a full three minutes to decipher what it said. How long did it take you? Often we skip over what stares us in the face. Y O U R A R E L Y S E E W H A T I S R I G H T I N F R O N T O F Y O U. You rarely see what is right in front of you. I tested myself on this in the public library. Pretend you’re me. You see a man at a table. But you observe his T-shirt with a slogan on it from a nearby military unit. You observe the computer in front of him and the books laid out before him indicating he is studying some kind of college course. Note the time. It’s late morning. Note his facial features that tell you he’s middle aged. Then you see his haircut—short, but not quite military short. What do you think? With somewhat stunning accuracy you might deduce that he’s transitioning out of the military into civilian life and taking a college course to prepare for his next job. Of course, we don’t know for sure, but what gives us the power to make an educated guess? The skill of observation. Decide to become more observant. There are so many great pieces of advice on the internet. How many do you read in a day? On how many have you to taken concrete action? It’s not a question meant to induce guilt, but just a point about reality. If you commit to do something by saying it out loud or by writing it down then you’ve made a decision. That’s a start and maybe you know the saying, “Well begun is half done. 2. Take time to say what is obvious. Have you ever been in a group where the leader asked a softball first question and no one spoke? First questions tend to be observation questions with boring, obvious, and detail oriented answers. For some reason we feel stupid when we answer an easy question. Yet how much do you skip the most obvious details? Don’t be afraid to state the obvious. There’s probably at least one person for whom it isn’t. Once you’ve looked and stated the obvious you’re in a place to observe one level deeper. The second look is what usually yields the more in depth find. It’s usually connected to the obvious in some way though, so if you didn’t do number 2 above and state the obvious you might miss the greater depth of a second look, and then a third and fourth also. Change your line of sight. Imagine that the floor is the ceiling. (Or if you like Orson Scott Card then consider that “the enemy’s gate is down.”) Take a knee and look at your house through the eyes of a toddler. Read something written upside down, or in a different language. Rewrite something yourself in a different color ink. Just like the picture described above, looking at something from a different vantage point makes us more observant about what is right in front of us. We take in more detail. Ask someone else what they see. Don’t fool yourself into thinking that you are alone. Sharing is caring. Read something you’re observing out loud to another person and ask what details they hear. Ask a young child what they see in a picture. Outsource some of the work of observation and add it to your own. It will make you more observant and it will communicate to others that you value how they see the world. Who doesn’t want to find ways to value others more? Information comes at all of us with blinding speed these days. Take time to see what is right in front of you. Take time to do more than merely see though. Take time to observe.